The internet is full of fabulous facts about everything from current events to the history basket weaving and taco fun facts. As we research for our daily content on food trucks, food carts and street food, we stumble upon some items of knowledge that we just did not know. For today’s Did You Know we will look at Taco fun facts. 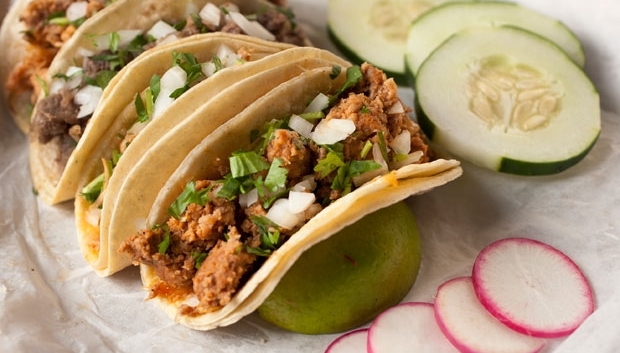 Taco Fun Facts: While the word “taco” literally translates to “plug” or “wad” a small hole, it also translates to “light lunch” in Mexican Spanish. Taco Bell started as Bell’s Hamburgers and Hot Dogs in San Bernardino, CA back in 1950 by Glen W. Bell Jr.. Bell’s Hamburgers and Hot Dogs began as a hamburger stand selling fast foods such as burgers, hot dogs, fries, and shakes. Then, taking advantage that his stand was located in a Hispanic neighborhood, Bell started selling crispy-hard-shell tacos at 19 cents each. October 3rd is National Taco Day. Ensenada, Mexico is said to be the birth place of the fish taco. Taco Bell uses at least 600,000 cows’ worth of beef per year. According to Taco Bell’s own website, they serve an average of 295 million pounds of ground beef every year. A “Taquería” is a Spanish word meaning taco shop. Originally, the term “taqueria” was used to refer to street vendors, although the term has come to be used more generally to refer to any sort of establishment which serves authentic Mexican food. Check out our Authentic Carne Asada Taco Recipe! Let us know if we missed any taco fun facts. If we can verify that the facts is just that, a fact, we will give the reader credit in the article. Reference: Wikipedia: Fun Facts about Tacos.